Sunday’s contest between India and Australia is a very crucial game for both the teams. 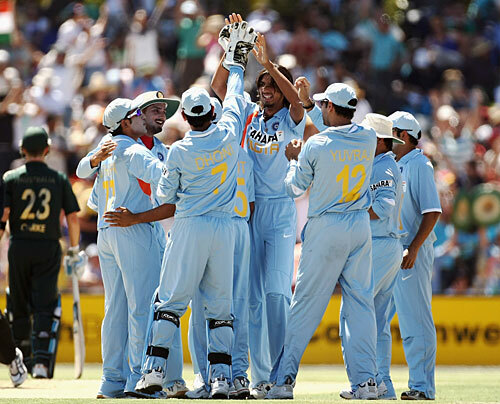 Its almost certain that India would join Australia in the best of 3 finals after Srilanka’s loss in Melbourne on Friday. Srilanka will be very dissapointed as this is not the first time their batting has let them down against the Aussies in this series. Srilanka though need to win both their matches from here on and hope India loses theirs. The Indian team though pulled off a crucial win against the Lankans on Tuesday to go up by 6 points on the table. One thing which is common to all the three sides in this series is that their batting has struggled. The bowlers from all the three sides have had great success in this series and the fact that there has been just two 250+ totals in this series is shocking considering the batting strength of the sides. India would hoping to keep the trend going as I think the best possible scenario would be for India to bat first and post a challenging total on the board. Dhoni who has had pretty ordinary luck with the tosses would want to win one soon. Teams have generally found it difficult to chase as the pitches have been really difficult to bat on. The Australian batsmen except for Clarke and Hussey have found it really hard in this series to get the ball off the square. The Indians would hope to keep it that way. The Indian bowling has been great throughout the tour with Ishant Sharma being the find of this series. Ishant has been getting able support from Sreesanth, Munaf and Irfan and as a unit they have been able to keep the Australian batsmen quiet. Both the teams have each won one game in their previous three meetings and whoever wins this one will get a slight edge before the finals. India would like to win this one and completely eliminate Srilanka from the picture. All in all this promises to be a great game and we hope that it lives up to the expectation.